I’ve never seen an angel, though I’ve longed to. I suspect if one came to me I’d either not recognize it or be scared to death, just like Mary was when Gabriel visited her in Nazareth over 2,000 years ago. Luke tells us Mary felt greatly troubled and tried to figure out why an angel would come to speak with her. The angel Gabriel presented Mary with a life-changing proposition. God wanted to turn her world upside down. He had chosen her to bear His offspring. 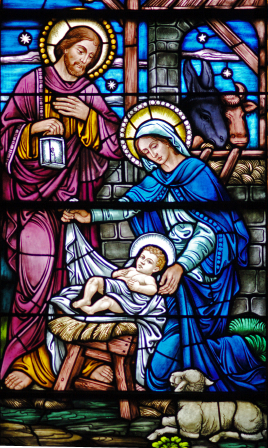 He wanted Mary to be the mother of God. Frightened and confused, Mary didn’t understand. How could she get pregnant? She was a virgin. This made no sense to her. The mother of God? How can this be? And yet, despite Mary’s confusion, uncertainty, and fear of the future, Mary chose surrender. She said yes to God. Without hesitating she said, “Behold, I am the servant of the Lord; let it be to me according to your word” (Luke 1:38). Mary’s refusal would not have thwarted God’s plan. He would chosen another young virgin who was willing and Jesus would have been born despite Mary’s no. Yet Mary would have missed her calling. She would have missed the opportunity to be a central figure in human history and God’s story. God’s work did not end at the birth or death of Christ. Each day He presents opportunities to you and me to say Yes to him. He invites us to be his partner in shaping history. To partner with him in his STORY. These opportunities might not come through the message of an angel. Most often they come through difficult life circumstances that we find ourselves in. But however and whenever they come, they feel just as confusing, scary and uncertain as Mary’s invitation did. Mary didn’t know what would happened but chose to courageously face the wagging tongues and public shame of being an unmarried woman who was pregnant. She accepted the risk of being rejected by Joseph. She knew her whole future life was about to shift from what she wanted and what she planned to what God wanted. Still, she was wiling to embrace God’s plan for her, not knowing for sure what lay ahead. How many times do you and I refuse to embrace what God brings us to carry? It feels too hard, too scary, too costly. We don’t’ want to be burdened, rejected, embarassed, inconvienced, or deprived of what we want. We don’t want to give birth to God’s character in us if it means suffering, sacrifice, loss, or humuliation. God invites us to embrace the moment he brings to us, not run from it. He invites us to partner with him, like Mary and Joseph, in His plans. He doesn’t always let us see the big picture, He just asks us to trust Him and yield. To choose Yes! This season I invite you to choose to say Yes to God. Allow God to birth Christ in you so that your life is not about you or for you, but about allowing Him to use you to magnify Him. Question: I am unsure how to set up boundaries and consequences with my alcoholic, pot-smoking husband. He thinks neither should be a concern of mine. He says it doesn’t affect me. When he has too much to drink, his verbal cocky language, insinuations, and controlling attitude are horrible. 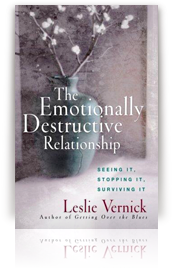 The Emotionally Destructive Relationship by Leslie Vernick. Plus see the winner of the previous give away! Stop. Dare to ask the question: What’s going wrong in the relationship? Maybe it doesn’t seem to be “abuse”. No bruises, no sexual violation. Even smiles on the surface. Nonetheless, before your eyes, a person is being destroyed emotionally. Perhaps that person is someone you want to help. Perhaps it’s you. Do you want to change? Within the pages of this book, you will find biblically sound, straight-forward help to take the first step today. To win this book, please email your name to assistant@leslievernick.com with "Book Give Away" in the subject line by midnight Sunday, December 15th. The winners of How To Find Selfless Joy In A Me-First World by Leslie Vernick are: Bambi S and Karol H.